-- Excellent, unique house show with a very well-done Bret Hart tribute night. The “Smackdown” wrestlers had their working shoes on the whole night. Very rough crowd estimate: 10,000 (all lower and mid-level seats were sold; many upper seats were empty). The crowd was very hot the whole night and didn’t let up. 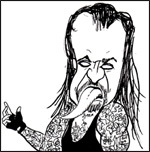 -- Bret Hart tribute notes: after the second match, Howard Finkel was introduced as the host of the evening for the Bret Hart tribute. 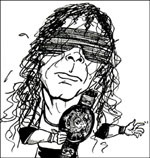 Finkel promised a number of video look-backs at major Bret Hart matches at Madison Square Garden. There were four video tributes (a few minutes long each) after the second, third, fourth, and fifth matches. (4) Melina & Kelly Kelly beat Unified Divas champion Michelle McCool & Layla. For the finish, Hornswoggle ran out and distracted the heels allowing Melina to schoolboy Layla for the pin. Next was the Bret Hart tribute. Howard Finkel first introduced guest Jerry Lawler, who was announced as special referee for the evening's featured tag match. Hart Dynasty came out, followed by Bret Hart. Finkel gave Bret Hart the following gifts: Framed photos of Bret & Helen Hart, Bret with Owen Hart, and Bret with Stu Hart and his brothers. Also, a jersey from the N.Y. Rangers and Madison Square Garden customized for Bret with #10. The crowd broke into a "Thank you, Bret" chant. Nexus then came out and offered Bret a chance to join them, and thus survive the evening. Bret wasn’t interested, which led to the six-man tag. (6) Bret Hart & Hart Dynasty (Tyson Kidd & D.H. Smith) beat Nexus (Michael Tarver & Heath Slater & Justin Gabriel) in a six-man tag match with Jerry Lawler as special referee. The finish was Hart making Gabriel submit to the Sharpshooter, which drew a huge pop from the crowd. Overall, Bret was over big. He was in early on offense, had a second appearance in the middle of the match predominantly working with Slater, and was tagged in to get the submission (with the tag itself getting a huge pop). It was the best match of the night. Everyone was solid, but the focus was on Bret. The crowd chanted, “We want Bret,” several times when others were having trouble with Nexus. (7) Big Show beat C.M. Punk. Show won with a chokeslam, KO punch, and scored the pin. Another good match, with some offense by Punk prior to his destined demise. The next show announced was a Smackdown house show at the Izod Center in the Meadowlands on Thursday, Dec. 30. Tickets go on-sale Saturday, Oct. 2.